(Bloomberg) -- Chinese banks dragged down the region’s stock indexes on Friday after the regulator’s unprecedented move to set lending targets for private companies, its latest attempt to support economic growth at the risk of swelling bad debt. 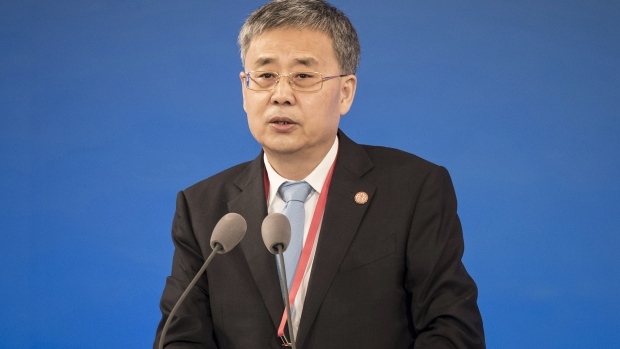 China aims to boost large banks’ loans to private firms to at least one-third of new corporate lending, Guo Shuqing, chairman of the China Banking and Insurance Regulatory Commission told the Financial News in an interview published late Thursday. The target for small and medium-sized banks is higher at two-thirds. This is the first time China has set formal goals for private lending, indicating that earlier efforts haven’t triggered the necessary credit expansion. Policy makers need to make sure that private firms -- which account for the majority of the nation’s gross domestic product -- survive amid an escalating trade war, plunging stock market and record corporate defaults. Banks paced a 2.1 percent drop in Hong Kong’s main stock index as of 11:11 a.m. local time on Friday. Industrial & Commercial Bank of China Ltd., the world’s biggest lender, fell 2.9 percent, China Construction Bank Corp. retreated 2 percent, HSBC Holdings Plc 1.2 percent, Bank of China Ltd. 2.3 percent and China Merchants Bank Co. plunged 4.9 percent. Guo also asked that loans to private companies account for at least 50 percent of total new corporate lending in three years. Banks’ loans to non-state firms were less than a quarter of their total credit at the end of September, official data show.